Free 12/12/16 to 12/16/16 Newbie investigator, Gwynn Reznick is ordered to stay low profile in her first undercover assignment, but stumbles upon a brutal murder. 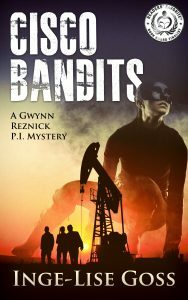 Ignoring her boss’s directives, she discovers another employee died in a suspicious oil well accident and a large quantity of oil is missing from the Cisco field. Gwynn begins a dangerous pursuit to find the perpetrators, and soon encounters a dark organization, rife with sadistic predators. Can she crack the case with the killers hot on her tail?